Vélo Vogue: Bike Wardrobe Remix: We are not the elite. Bike Wardrobe Remix: We are not the elite. Where did people start getting the idea that bike fashion blogs are dictating what people are supposed to wear on a bicycle? Au contraire! We here at Vélo Vogue say "Vive La Difference!" 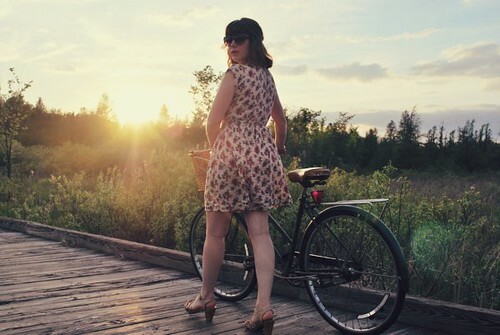 We celebrate the diversity, ingenuity and unique style of each man and woman who chooses to ride a bicycle. This movement began as a revolt of sorts to the "uniform" of the lycra-clad or skinny-jeans + hoodie bicycle crowds (and sometimes we choose to wear those uniforms too - they can be perfect for the right occasion). You really can wear whatever you like on a bike. These images should inspire you that your bike style choices are limitless and are not dictated by haute couture or anyone for that matter. 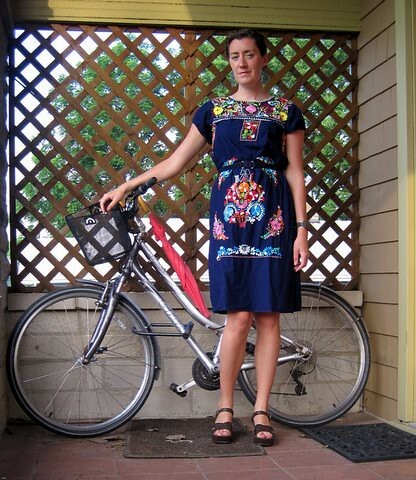 Without further ado, here is the latest installment of Bike Wardrobe Remix. I guess every day I wear a floral print and ride the bike with the floral Basil panniers on will be a floral mash-up. 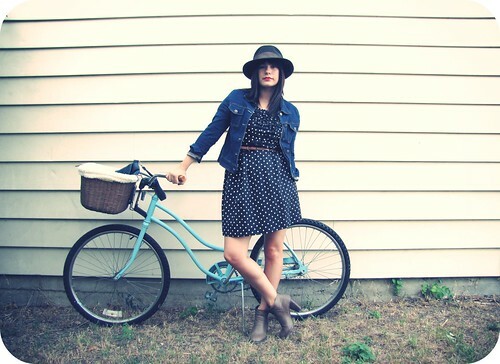 Keds match panniers beautifully! HOT JULY Morning in Central Park + Biker in the background. It's inspired by a typical mizket look again, but then I reeaally like the belt-over-shirt thing. Gives the outfit a medieval touch. P.S. This is KT officially calling Ramona Wheelright back to Vélo Vogue! @Elizabeth - your first time won't be your last, I have a feeling. @Unknown - you just don't have the guts to wear shoes as badass as that. great remix kT! I am inspired and by all you beautiful bike people remixing! and flattered by kt's request, Ill be back on bwr again real soon. Wow, I love macdon513's dress. What a find! Thanks again to all of you for sharing your portraits with us on our flickr photo pool. Yeah, I wear my flipflops when I ride. I was going to say thongs but nah. Is 7x7 out of touch with The City? Punctured Bicycle On a Hillside Desolate! Give it up for Mom! Different Bikes for Different Dudes?